1 of 1 Heat oven to 375 degrees F. Coat indents of one 12-cup muffin pan with nonstick cooking spray, see Note. 1 of 1 In medium-size bowl, combine flour and brown sugar. Cut in butter until mixture is crumbly. Stir in nuts and set aside. 1 of 3 In large bowl, whisk together flour, nuts, baking soda, pumpkin pie spice and salt. 2 of 3 In a medium-size bowl, whisk bananas, granulated sugar, milk, brown sugar and egg. Make a well in flour mixture; add banana mixture. Stir until ingredients are just moistened. 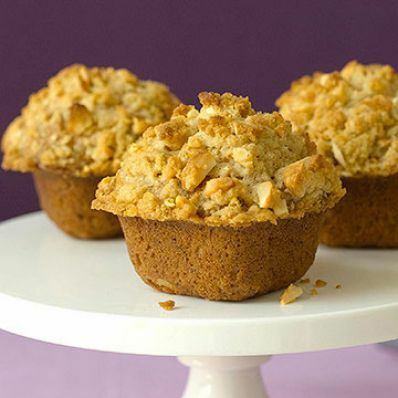 3 of 3 Spoon a rounded 1/4 cup of batter into each muffin cup. Evenly crumble topping over each. Bake at 375 degrees for 20 minutes or until a toothpick comes out clean. Cool in pan on rack for 5 minutes. Release muffins with a spatula and cool completely on a rack. Makes 12 muffins.